It’s that time of the year, friends. The new year is just around the corner, and so that means it is time for planners! 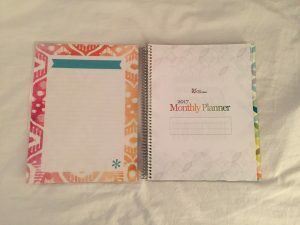 In the spirit of the planner season, I am giving you guys an overview of the 2017 Erin Condren Deluxe Monthly Planner. 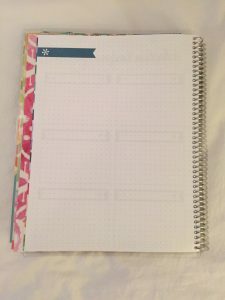 I have used the EC Life Planner for the past couple of years, and while I love the quality of EC products, I don’t really use the weekly layout as much as I should. 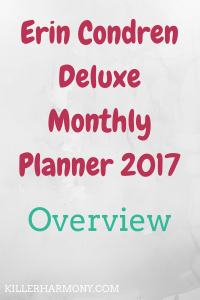 This year, I decided to go for the new Deluxe Monthly Planner. 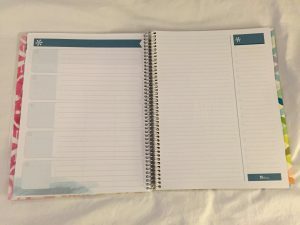 It’s cheaper than the Life Planner, but it has almost all of the same features. Let’s take a look, shall we? This is the cover of the planner. I went with the larger 8.5 x 11 inch planner, since I wouldn’t have the weeks, and I chose the pattern Ikat. The cover is nice and is laminated, so it will last all year. As with the Life Planners, you can take off the cover and replace it, if you are interested in that. When you first open up the planner, you get a white board that you can write on. You can put assignments, test dates or random notes here. You could also stick a notepad there, too. 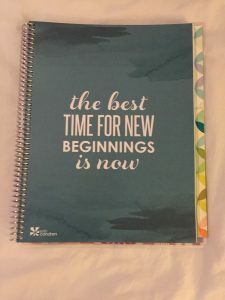 On the first page of the planner, you have a page with information on the planner as well as a place to write your personal contact info. Next, you have a couple of pages with quotes with a nice rainbow background. 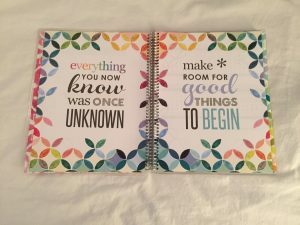 The cool thing about the Erin Condren planners is that they all have cute quotes to inspire you. 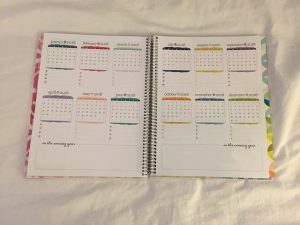 The colors are also nice and make planning more fun. The first calendar page is an overview of 2017 with some space to write down big picture goals or whatever you want. I will probably write some of my big year long goals in that space so that I don’t forget them. I don’t really use the year long calendar, but I’m sure there are tons of ways to use it. This isn’t really a calendar page, but the next layout has twelve boxes where you can write down some goals you have for each month or maybe goals for different parts of your life. 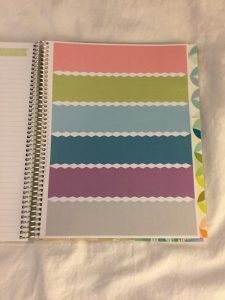 Again, customization is one of the best things about the Erin Condren brand. Another not-really-a-calendar-page, before each month, you get a dot grid page. You can’t really see it in the picture, though. 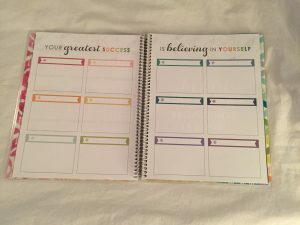 These pages could be used for monthly goals, notes, or budgeting. I will probably use these pages to track my income and expenses. I want to start off with a good budget since I will be working graduating in May. Also before each month, is a different quote page, with a different background color for each month. I think this quote is pretty perfect for January. Note: if you get the neutral version, you will have all black and white pages throughout your planner. Next up, we have the monthly layout. Since I got the larger planner, the boxes have a ton of room to write in, which is awesome. I will be using the monthly calendars to plan out my blogging editorial calendar as well as other important dates. The right hand side of this page is also nice, because it has a lined section for goals and to dos for the month. This is a great way to remind yourself of your goals and items on your to do list. I will probably use this section for the more time sensitive/important things I need to do. The next spread has one page with five boxes so that you can categorize things or break big projects into steps. I haven’t thought too much about how I would use this section. I might have a box for my blog, school, client/job work, personal and other. That might change. The other page has some lines as well as lines with check boxes on the right. This is probably where I will do the most intense planning, since I can write out ideas and plan details for different projects. This last planning page is for 2018. If I think of plans for the following year, I can write them down and then transfer them to a new planner later. 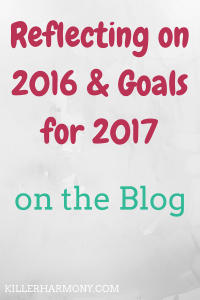 I can write a few things for each month as well as yearly goals. In the back of the planner, you have a bunch of blank lined note pages. The planner comes with forty pages, or you can add an extra forty (80 total) for five dollars. I decided to add the extra pages, because I would be using them more since I would not have weekly pages. I will use these pages for things like big to do lists, random notes and possibly ideas for my blog and biz. After the note pages, you have two full sheets of stickers. I’m guessing you probably would not get as many stickers with a 7 x 9 planner, because there would not enough space. You would still get some, though. I will also be using stickers that I didn’t use in my previous planners, because, why not? In the very back of the planner, you also get a nice big pocket to hold random things like stickers or loose sheets of paper. Since you can take the covers off, you can even move the folder to the front, if you like. You could also move the stickers with it. The last thing in the planner is the back of the pocket, with a shallower folder, and a dry erase board on the back cover. Again, you can use the dry erase board for just about anything. I do think that I will not use this side of the pocket just because it is so short. I’m worried that things might fall out, but at least it’s there in case I do need it. 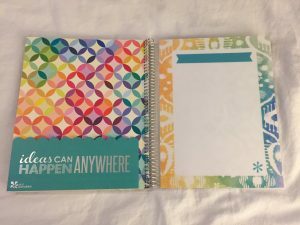 That is a look inside my new Erin Condren Planner for 2017. I really love their products. The paper in the planners is just amazing, the covers are super sturdy and they’re really cute. That’s a total plus. 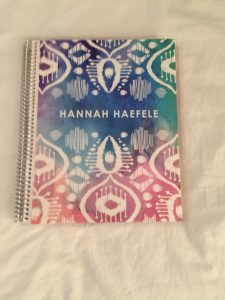 If you would like to get a planner for yourself or as a late holiday gift, you can use my referral link for ten dollars off your purchase (I get ten dollars off, too!). 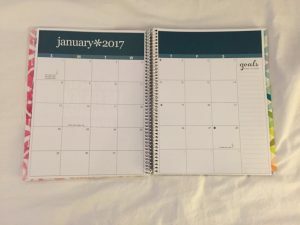 Have you bought your planner for this year? Are you excited to use it? Let me know in the comments! Also, be sure to read some of my other posts and follow me on Twitter (@HannahHaefele) so you don’t miss future updates! 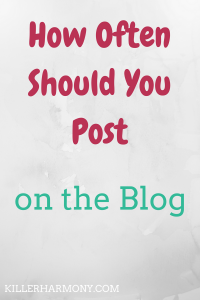 Author HannahPosted on December 24, 2016 December 23, 2016 Categories BloggingLeave a comment on How Often Should You Blog? I know finals just ended for the fall semester, but in just a few short weeks, the spring semester will begin. You have a new schedule, new classes and might need to get some new supplies. Winter break, especially after the holidays, is a great time to get organized for the upcoming semester. It’s cold out, and you don’t have too much to do, so why not get everything together. 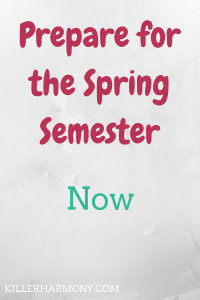 Here are a few ideas for how to prepare for the spring semester now. 1. Clear out your backpack. After finals, you probably didn’t want to think about school or your backpack. It’s still full of your old books and binders, right? No shame, but you don’t want to wait until the night before classes to clean it out. Take out all of your old books and supplies that you no longer need. Get rid of any trash that inevitably collected in the bottom of your bag. Set things you don’t need aside and in a safe place. Make sure your backpack is all ready for the new semester. 2. Re-evaluate your organization strategies. With your new set of classes, it’s the perfect time to evaluate what worked, what didn’t and what you should do next semester. If you had a semester of lecture classes but next time will be more labs or discussions, you might need to organize your stuff a little differently. This is also a good time to reorganize your planner. 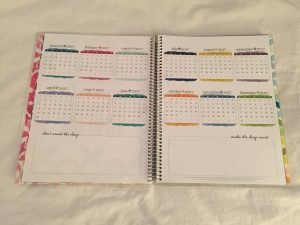 If you buy your planner with the calendar year, you will have a new planner to work with. If you bought a planner in August, you can look back at your previous semester and see what changes you can make. 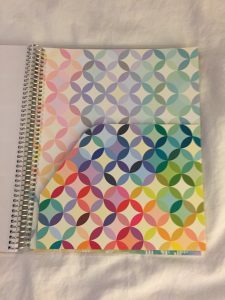 I know I tend to neglect my planner as the semester goes on, so do something to spruce up your planner and make it more interesting. It’s a lot easier to use something that you like and makes you want to get organized. Order your textbooks as soon as you can. Even if you have that dreaded book that you can only get at your school’s bookstore, order it. You don’t want to get back to campus only to be put on a wait list for your books. Look in Facebook groups for textbook exchanges and set up something, if you can. Order available book store online, or order ahead from the bookstore. Figure out what you need to buy and what you can reuse. Once you have your supplies, put them all in one place so you don’t forget them when you go back to school. Make sure you know where all of your pens and pencils are and whether you need to buy more. If you like colored pens, make sure they all have enough ink or buy some backups. Lastly, take advantage of your extra time off and relax. The fall semester can be hard, especially after a summer off. With the stress of the holidays, it can be hard to stay relaxed, but it’s important. You won’t have as much time to relax once classes start. Those are five of my best tips for preparing for the spring semester over winter break. Classes are never fun to think about, but getting organized over the break can make your first week back that much easier. What do you do to prepare for classes over break? Let me know in the comments. Also, be sure to follow me on Twitter (@HannahHaefele) and catch up on my recent blog posts! The holiday season is one of the most stressful times of the year. People are rushing to get gifts, you have to bake goodies to take to a family gathering and who knows? You might even be hosting a holiday party. All of that stress at the end of the year can get to you, so you need easy ways to destress. It can be easy to get burnt out if you are not careful. To avoid that burn out, you need some ideas for ways to destress during this hectic season. 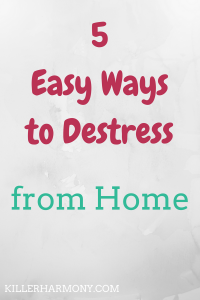 That is why I have five easy ways for you to get rid of stress from the comfort of your own home. Your body simply won’t be able to function without enough sleep. While it may seem like we do nothing during sleep, that is when our bodies convert short term memories into long term and heal damaged cells. The point is, sleep is necessary, and it’s a great way to get away from the hectic holidays for a few hours. If you want an easy way to relax that won’t take too long, try taking a bath. You can get a bath bomb or go au natural and just wing it. Taking a bath allows you to just be with yourself and your thoughts for awhile. You get to relax in a warm tub all by yourself. Who wouldn’t want that? With the stress of final exams or year end business, you probably haven’t had a chance to watch some of your favorite shows, but now you can. Catch up on new releases on Netflix or Hulu or watch some of your favorite YouTubers. Watching a comedy video or show is a great way to unwind and destress. Reading is a great destress method. You can find a fiction book and get into the story. Or you can read something nonfiction and maybe learn something new. Reread the Harry Potter series if you like. You can check out the newest blog posts, if that’s more your speed. Either way, reading gives you something to focus on that is separate from the stress you might be facing due to the holidays. If you would prefer to write or draw instead of read or watch, this idea is for you. 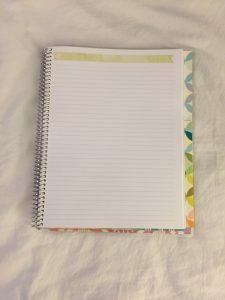 Odds are you can find a blank (or almost blank) notebook in your house or for cheap. Maybe you have an old journal that still has a ton of empty pages. Why not start a journal. You can write or draw whatever you want in it, and you can keep it a secret or share it with your friends. Maybe it’s just me, but nothing feels better than an organized living space. If you feel that way, why not put on some of your favorite songs and organize your space? If you are visiting home for the holidays, your room is probably a little neglected, so give it some TLC and make it tidy. That way, you can more easily find stuff without having to stress too much. Those are some of my favorite ways to destress. Most of them (if not all) can be done without leaving your house! That makes it super easy to relax and stay sane, especially now that it is officially winter.